Our tour of the Northland completed (at least for now), we were ready for more permanent surroundings, so we set out down State Highway 1 bound for Wellington. 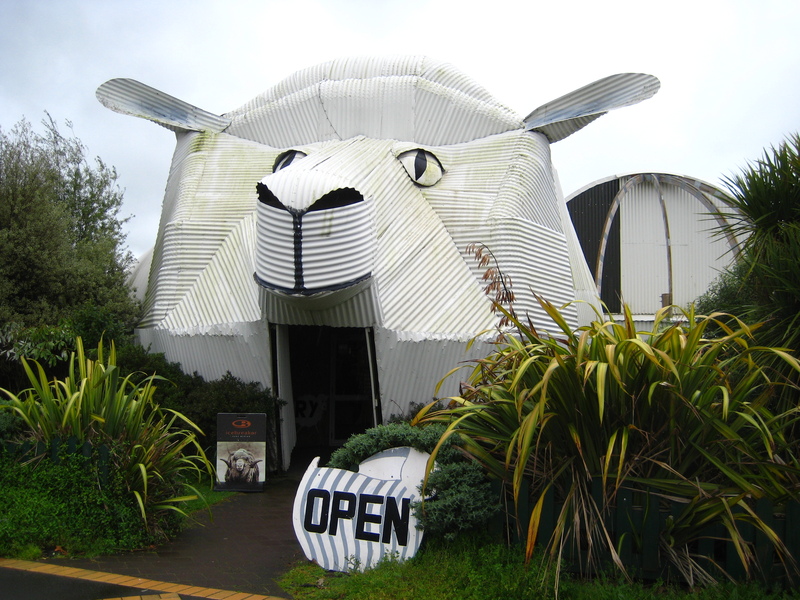 On the way, we came to the conclusion that New Zealand has way more awesome roadside kitsch than the US. Also, pigs. 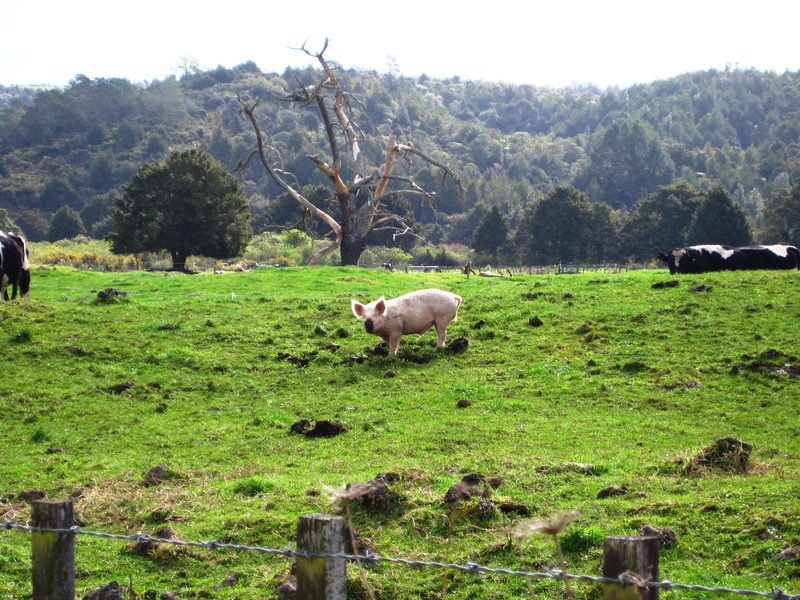 A lonely pig grazing amongst cows. Becky fell a little in love with this charming gentleman. Inside this structure is a shop that sells - you guessed it - woolen goods from New Zealand's finest. 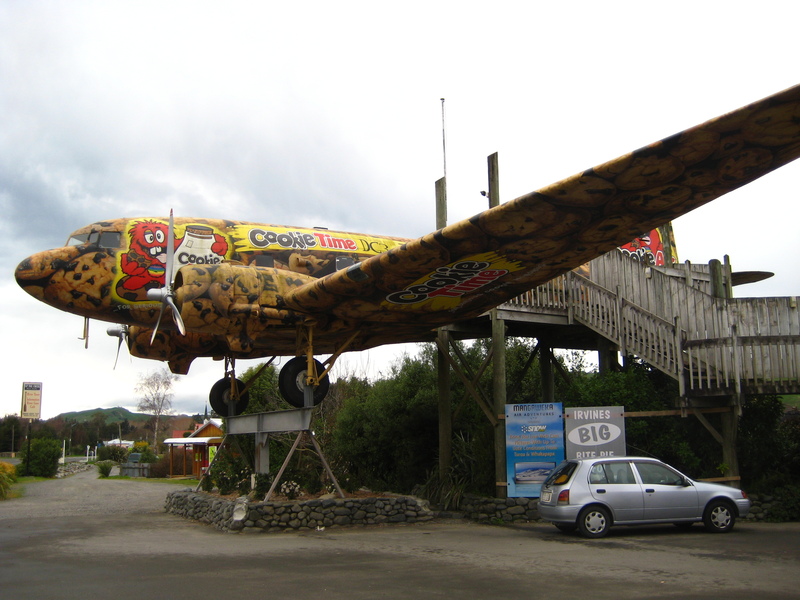 This WWII-era plane was converted into a (cookie-themed) cafe. On any long drive you’ll have to stop for a bathroom break, but how often are the comfort facilities actually a tourist draw in their own right? 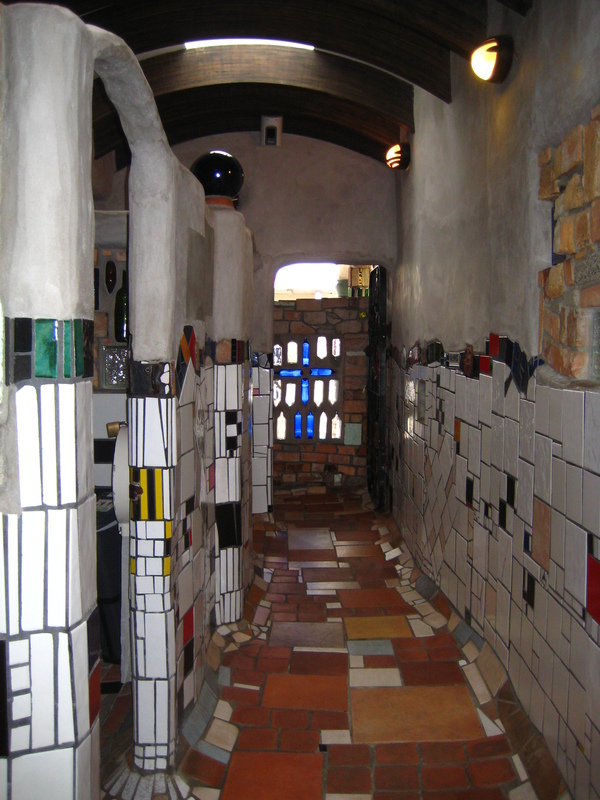 In Kawakawa, the public toilets were desgned by the renowned Austrian artist and architect Frederick Hundertwasser, who had retired there. It was his last major work before his death. The windows are made of wine and liquor bottles in cement. 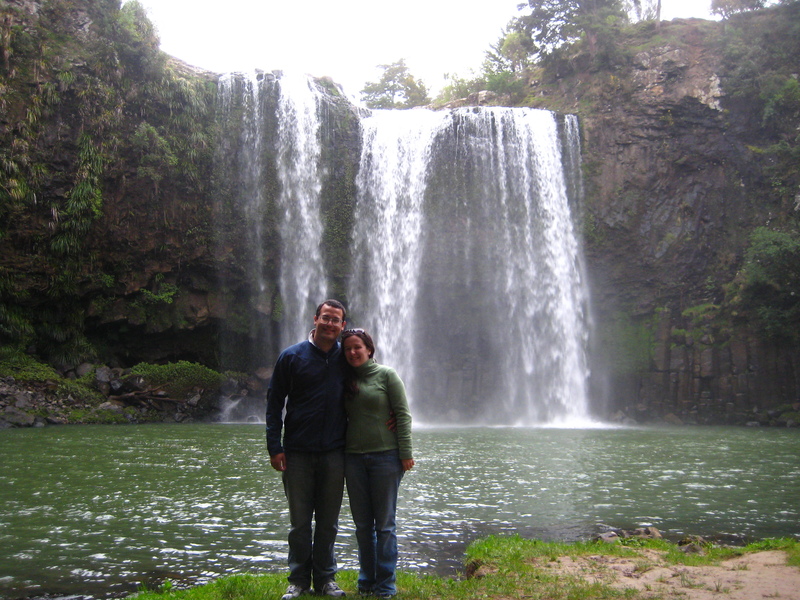 We stopped at Whangarei (FANG-er-ay) Falls in Northland to stretch our legs and see a beautiful waterfall. It was a short, easy hike down to the foot of the falls, and we were even able to walk over the river right at the top of the waterfall (on a footbridge — don’t freak out, Mom). 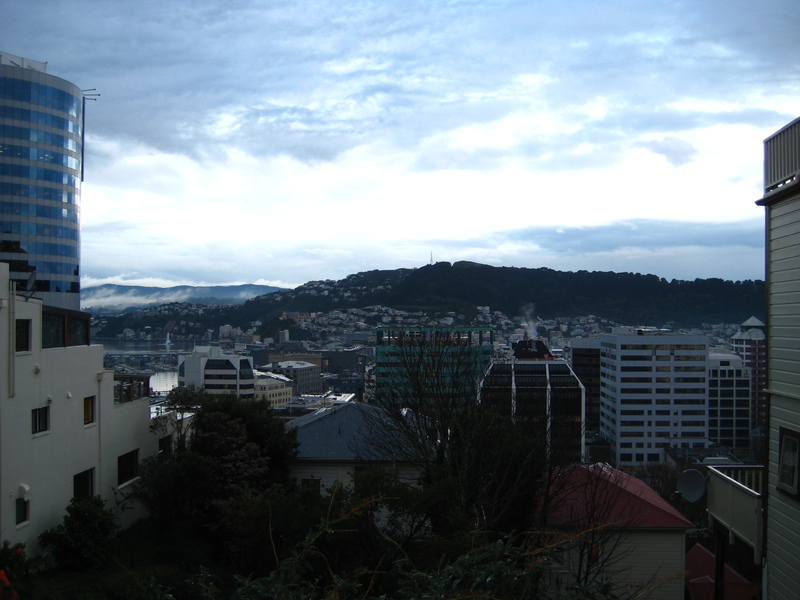 We hit Wellington just before dusk on Monday and were able to see a little of the city before checking into our hostel and starting our housing hunt. Home at last, once we find one! This entry was posted on September 9, 2008 at 3:11 pm and is filed under Uncategorized. You can follow any responses to this entry through the RSS 2.0 feed. You can leave a response, or trackback from your own site. I love the sign in front of the wool selling place, and I want that bathroom. How fantastic!! Those falls are enchanting. Do you guys think you may go to see haka sometime? I’ve seen some YouTube videos, but I’m sure live is something truly moving. I’m so excited for you guys! I’ll just sit in my little grad student office wondering about all of the amazing sights you’re seeing and be so so jealous. Becky, can I ask for an NZ sheep postcard? I’m thinking with that one and the Ireland sheep postcard from you I can create a little collection, haha.